Many of the tasks you can do on a computer, you can also do on asmartphone or tablet. The computing power of a flagship smartphone generally rivals the best laptops and desktop computers of about five years ago. However, with the aid of multiple processors, 6+ gigabytes of RAM, and powerful graphics hardware, the best smartphones and tablets can be as powerful as a mid-range desktop computer. Also, they can be just as expensive. If you're deciding whether your next device upgrade should be a desktop computer or a mobile device, there are some key points to consider. Below is a chart that highlights some of the key differences and similarities of each. Power If you want high performance, the CPU will use a lot of electricity. The TDP of a powerful desktop computer can range from 100 to 600 watts, or more. That's why high-performance computers are plugged into a wall: they use a lot of power. They also generate a lot of heat, often requiring large heat sinks (passive cooling) as well as fans or liquid cooling (active). Smartphones and tablets run on batteries, which means they have to use power as efficiently as possible. It would not be feasible to provide raw, constant CPU power to a device powered by such a small battery. So the newest smartphone will not give you as much power as a top-of-the-line desktop computer — in the foreseeable future, anyway. Mobile devices are getting more powerful every day, but traditional computers will always have the performance edge due to consistent access to more electricity. Cost Prices for a computer can vary widely, depending on its capabilities,storage, and features. A mid-range computer usually costs between $500 and $800 USD, and some of that cost can be offset if you already own peripherals such as amonitor,keyboard, and mouse. More powerful computers will cost you between $1000 and $3000, or more. The price of a smartphone is often folded into the cost of a multi-year contract with a mobile services provider, such asVerizon or AT&T. Refurbished smartphones can usually be purchased on sites such asEBay or Amazonfor $100-$300 USD, and a flagship smartphone, brand new, can cost as much as $800. Tablets, depending on size, usually cost between $300 and $700. Screen size Desktop computers can connect to a wide variety of monitors, allowing you to invest as much or as little as you want into that component of your computer. Most modern computer monitors areLCDs. Depending on their size, quality, and features, they generally cost between $50 and $600 (although some can cost much more). Theirresolutionsgenerally range from 1600x900 to 2560x1600. With a 4 K monitor, your computer can display resolutions of 3840x2160. Laptops typically feature screen sizes between 13" and 17", with resolutions ranging from 1336x768 and 2880x1800. Smartphone screens vary somewhat depending on the manufacturer and model. The Apple iPhone 7 has a 4.7" screen, and runs at a resolution of 750x1334. The HTC 10 Android phone on the other hand has a 5.2" screen and a display resolution of 1440x2560. Portability Laptop computers, of course, are portable by design. Desktop computers on the other hand are not usually considered portable, but there are exceptions. A NUC, for example, is typically no more than 5" wide and long, and less than 2" high, with a weight slightly more than 1 lb. Computers designed for the Mini-ITXform factor are also highly portable, with the smallest cases sized about 8" x 8" x 3". Some Mini-ITX cases are even designed with a handle on top, which is great for gamers, for example, who might want to bring their machine to aLAN party. Smartphones are lightweight and can fit in a purse or pocket. They are designed to be taken everywhere with you — the very definition of portability. A tablet won't fit into your pocket, but they're light and you can carry them in one hand. Storage Consumerhard drivecapacities already exceed oneterabyte (TB) and they continue to increase in size. Even the most basic computer comes with a 250 gigabyte (GB) hard drive today. This applies to both desktop and laptop computers. Netbooks such as the Google Chromebook, which is designed primarily for working within a web browser, sometimes offer only 16 or 32 GB of space. You can always add additional internal hard disks to your desktop computer, as long as you have available drive bays and interface connections available. An external hard disk can be added to desktop, laptop, andnetbookcomputers. Most smartphones and tablets come with between 8 GB and 64 GB of built-in storage. (In some cases, an expansion slot may be available for an additional memory chip providing removable storage.) Smartphones and tablets will offer less storage capacity than a computer, and their components cannot be modified like a computer's. It's a good idea to know how much storage you require before purchasing your device, and factor that into your decision. Connectivity Desktop computers generally come withEthernetcapability, either on themotherboardor a discreteNIC. Most desktop computers require aperipheraldevice, such as a USB Wi-Fi adapter, to connect to wireless networks. Most laptops include both Wi-Fi and Ethernet networking as a standard feature. Smartphones and tablets can connect to Wi-Fi networks for internet access. Also, smartphones can connect to a mobile data network, and many tablets offer mobile data connectivity as an option. These tablets can also usually make phone calls on your mobile network. Mobile data comes at a premium, however: most mobile data plans offer a set amount of data that you can use per month, offering additional data at an expensive, metered fee. Speed and consistency of mobile data connections depends on the technology used by your specific device and mobile network. Operating system Operating systems designed for computers and laptops are full-featured. They are designed to take advantage of fast CPUs, large amounts of disk space, and high amounts of RAM. Also, they take advantage of the features of modern chipsets that are not available on most mobile devices. Mobile operating systems (primarilyAndroid, iOS, andWindows Mobile) are specialized for a specific set of devices and a use cases. By default, they don't offer you complete access to your system hardware (Administrator or "root" access). They also have stricter hardware requirements because the ecosystem of mobile apps and devices is strongly connected to specific hardware features on the newest hardware. In other words, you can't run the newest apps on an older mobile OS and the newest mobile OS won't run on a significantly old device. Data Entry and user input A computer uses a keyboard for data entry that most users are familiar with and comfortable using. The mouse is also available for easy scrolling and clicking. Smartphones feature an on-screen touch keyboard that is much smaller than that of a standard computer. The smaller keyboard can make typing more difficult for users, especially for those who have big fingers. Some smartphones feature a slide-out keyboard, with actual keys to press. Again, this keyboard is much smaller than a standard computer keyboard and can still be difficult for some users. 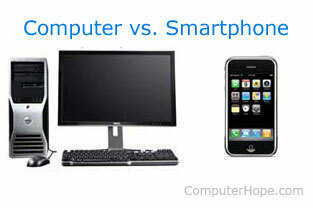 Most users today have both a smartphone and a computer in their home. They use a smartphone for phone calls, messaging, browsing the Internet, reading e-mail, and other small jobs and use a computer for more complicated projects or work. If you are trying to decide between only a smartphone or a computer, also consider a tablet or a hybrid computer, which offers the best of both a laptop and tablet. Finally, if you're considering a smartphone but don't think you'll use the Internet much, we highly recommend purchasing a feature phone instead of a smartphone to avoid monthly data costs.